In November 2000, an exotic seaweed called Kappaphycus alvarezii, was introduced in shallow waters off the coast in southern Tamil Nadu’s Ramanathapuram district by researchers of a government lab. It was field testing for a proposal from PepsiCo India, about cultivating seaweeds rich in carrageenan—complex kinds of sugars—an ingredient used in virtually every industry from food to cosmetics and medicine. The trials were successful and fishing communities were enthusiastic to farm it as it promised additional income. No independent environmental impact assessment was done, nor were the consequences of introducing an alien species so close to the ecologically rich and sensitive Gulf of Mannar Marine National Park discussed. Thus began the story of Pepsi paasi as the weed is locally known. Over the next 18 years fisherfolk saw their incomes rise and fall, PepsiCo exit, a new player enter, and a disease that wiped out yields. The seaweed has since been a source of bio-invasion, escaping to islands in the Gulf of Mannar and smothering corals—a environmental disaster in the making in India’s most sensitive marine zone. On a September morning, Thirucheluvarayan stands under a makeshift thatch shielding him from the burning sun and the blinding glint from the sea. He is alone on Olaikuda beach, hemmed in by thermocol boxes, fish baskets, floaters, nets, and pipes. Behind him, a handful of boats, anchored away from shore, rock to and fro after a night of fishing. Olaikuda is a 15-minute drive from the temple town of Rameswaram, past a new training centre for marine commandos. In this village of 300 households, fishing is the main livelihood. Only a bald forehead and two missing lower front teeth give away Thirucheluvarayan’s age of 55 years. 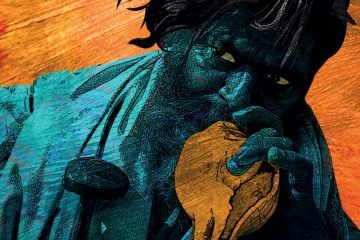 With great dexterity, his weather-worn hand takes a foot long wooden splinter with a rope tied at one end, and begins to weave a zigzag pattern on the net, like a knitting needle. Deep sea fishing fetches ₹200 to ₹300 a day, on good days up to ₹500 or ₹1,000. While this takes care of household expenses, Thirucheluvarayan’s hopes of making a good income this season rest closer to shore. He wades into the water, and climbs on to an electric blue canoe. With a bamboo pole twice his height, he paddles towards the sea for about 100 metres or so and stops. Four bamboo rafts float around him A little further ahead the waves break as they hit the corals. The corals protect the rafts from the strong waves during the rough season. The rafts are approximately 10 feet long on each side. An anchor holds each one in place. A series of 20 yellow plastic ropes are tied parallel to one side of the raft, at short intervals. Each rope has Pepsi paasi clinging to it. A net tied below prevents the weeds from drifting, and protects them from fishes nearby. The weed has a slimy glossiness to it, at times green at times a yellow-orange. Multiple filaments burst out from the main branch giving it a fibrous appearance, like a cluster of grape vines without the grape. Thirucheluvarayan’s hopes rest on Pepsi paasi. This early in September, he is cultivating seeds of the seaweed so that he has enough for his rafts when conditions are optimal for cultivation. This is typically between November and February when the temperature is low enough for the seaweed to thrive. The crop is ready for harvest in 45 days. 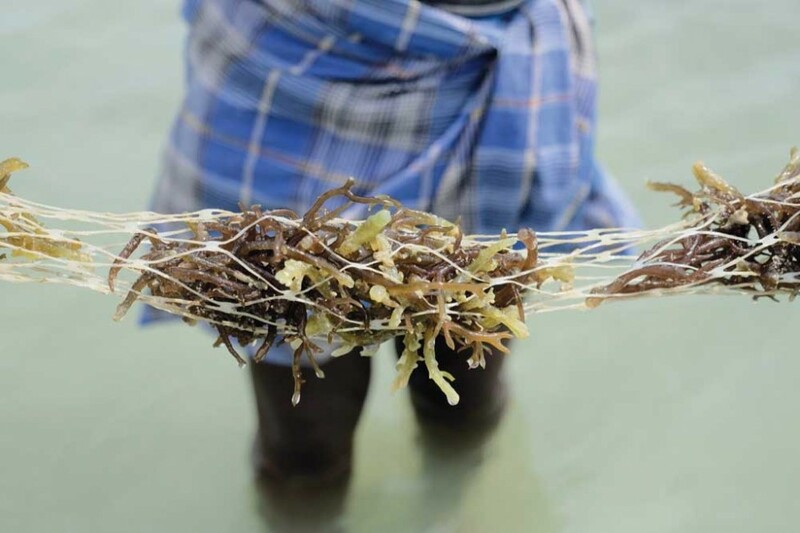 At its peak, the seaweed provided supplementary income for most fishing families in Ramanathapuram district. Thirucheluvarayan would set out at night in the sea to lay his nets, and remove them in the morning to sell the catch. And during the day, he would work on his rafts. For these families, paasi was a windfall. With guaranteed buyback from PepsiCo, families began thronging this trade. Each raft can produce 250 to 275 kilogrammes of seaweed. After drying, it shrinks to 100 kg. Once dried, it takes on a mixture of gray, pink, purple, and green hues. At ₹40 per kg of dried seaweed, a single raft can fetch ₹4,000 today. For Thirucheluvarayan, who has 50, this would mean nearly ₹2 lakh, or ₹4 lakh if he could turn the rafts twice. All of this would be profit if he and his family worked on the rafts and at least half if he employed labour from outside. In Olaikuda, more than three-fourths—around 250 families—began to dabble in farming the seaweed. With the money from the seaweed, people managed to send their children to schools and colleges, build pucca houses, deal with health scares. As the paasi grew, the good times rolled in. The programme was even praised by A. P. J. Abdul Kalam, the former President who hailed from Rameswaram. In his Technology Day address in 2006, Kalam said 1.5 lakh rafts covering 100 km of the coast would “generate coastal employment for over 2,000 families with an average income of over ₹6,000 per month”. Thirucheluvarayan with his cultivated Kappaphycus. Title image: Pambam Bridge near Rameshwaram. But even as Kalam was praising the initiative, a few scientists raised a red flag about the use of Kappaphycus alvarezii, an alien species so close to the Gulf of Mannar Biosphere Reserve. By 2008, scientific papers appeared that showed some of the seaweed had drifted from cultivation sites and established itself on islands in the biosphere. Coral reefs, these reports said, were being smothered by the seaweed. Even as the scientific community continued to go back and forth over the potential invasion, in 2014, another problem rose. Something was killing the seaweed. A disease was turning the seaweed white, making it powdery. With this, Thirucheluvarayan’s good times came to an end. He was in danger of defaulting on his loan of ₹1.5 lakh for building more rafts for Pepsi paasi. He managed to pay it back, but he barely made it. What helped him tide over this crisis was going back to fishing. Since 2015, he has attempted to cultivate the seaweed every year—all ending in failure. But, hope springs et ernal in Thirucheluvarayan. This year, he is going to give the Pepsi paasi another go. Kappaphycus alvarezii—the name by which Pepsi paasi is known around the world—belongs to a class of seaweeds that, when processed, produces carrageenan. It is used in food, meat packing, cosmetics, and medicines among other industries. Chemically, it’s a polysaccharide—sugars with complex structures—which can be formed into gels easily. According to the Food and Agriculture Organization (FAO) carrageenan seaweed farming production across the world increased from less than 1 million wet tonnes in 2000 to 5.6 million wet tonnes in 2010, with the corresponding farmgate value increasing from $72 million to $1.4 billion. India contributes only a small fraction of the global output while Indonesia and the Philippines together accounted for 90 per cent of world production in 2010. According to FAO, the production of cultivated carrageenan in 2010 was 4,240 wet tonnes in India. It imports over 2,000 tonnes of carrageenan annually. Specific data on the international trade of cultivated carrageenan seaweeds are not readily available. In 2016, a company called AquAgri alone was reported to have produced over 500 tonnes of carrageenan. AquAgri was formed by a former PepsiCo employee that took over Kappaphycus processing business after the multinational’s exit. The AquAgri facility at Manamadurai in southern Tamil Nadu produces 50 tonnes of semi-refined carrageenan annually, the majority for the domestic beverage industry as a clarifying agent. In the food industry, it’s widely used for its thickening and stabilising properties. Take curd, for instance. Homemade curd has a lot of water, which makes it lose its form easily. Packaged curd, on the other hand, is mixed with carrageenan to give it a solid and firm shape. It’s similarly used to package other food items like paneer, beer, ice cream, sauces, salad dressings, soy milk, jams, diet sodas, and vegetarian hot dogs. In the meat industry, it is used to ensure that meat retains its tenderness while transporting or exporting. Outside of food, carrageenan is also used in toothpaste, shampoos, air fresheners, lotions, lubes, and shoe polish. Carrageenan can be obtained only from a certain class of seaweeds—none of which are indigenous to the country. India’s naturally grown seaweeds are used to extract another class of products—agars and alginates. Till about the early 2000s, India virtually had no carrageenan industry. This changed as the Central Salt & Marine Chemicals Research Institute (CSMCRI), began a project in early 2000. Established in 1954, and focused on research in salt production, CSMCRI is headquartered in Bhavnagar, Gujarat, a state that accounts for more than three-fourths of India’s salt production. But its research interests went beyond salt—of which the most promising was seaweeds. India has a coastline that stretches over about 7,500 kilometres, with a highly diverse seaweed flora which numbers nearly 1,200 species. Indian conditions were ideal for seaweed farming to thrive. Yet, while a couple of research projects were undertaken, none really took off on a commercial scale. PepsiCo India approached the Council of Scientific and Industrial Research (CSIR) to cultivate carrageenan producing seaweeds under a CSR project. CSMCRI was roped in and by November 2000, they began work on a project—sponsored by PepsiCo—in the Gulf of Mannar, a shallow bay between Rameswaram and the west coast of Sri Lanka. This region was chosen as CSMCRI had a station at Mandapam, near Rameswaram. Vaibhav Mantri, who heads the Macro Algae group at CSMCRI and worked on the project, says they had to work out a lot of kinks before getting it right. They started with an algae called Hypnea musciformis, and tried two different modes of cultivation—shrimp culture in ponds and open sea experiments. “Unfortunately with Hypnea, the kind of product yield and characters they (PepsiCo) were looking for were not good. This seaweed could not achieve a particular critical growth rate,” Mantri says. It was not commercially viable. CSMCRI then decided to look at Kappaphycus. The institute had acquired a strain of the seaweed in 1984 from Japan. Initial trials were conducted in Port Okha in Gujarat, and subsequently at Mandapam in the late 90s. Kappaphycus turned out to be much more suited for the carrageenan project. “The properties and yield matched with PepsiCo’s requirements. It was growing nicely,” says Mantri. It also turned out that open sea cultivation produced better results than shrimp culture ponds. Buoyed by the success of the trials, both PepsiCo and CSMCRI wanted to expand the project. The cultivation technology was acquired by PepsiCo India from CSMCRI in 2001. The company initiated farming along the Palk Bay side of Mandapam. 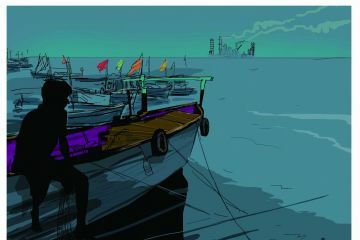 Munaikkadu, a fishing village near Mandapam was chosen for a pilot project. In 2002, the Tamil Nadu government leased 1 km of waterfront to PepsiCo for ₹2 lakh. PepsiCo used 100 kg seeds for cultivation. 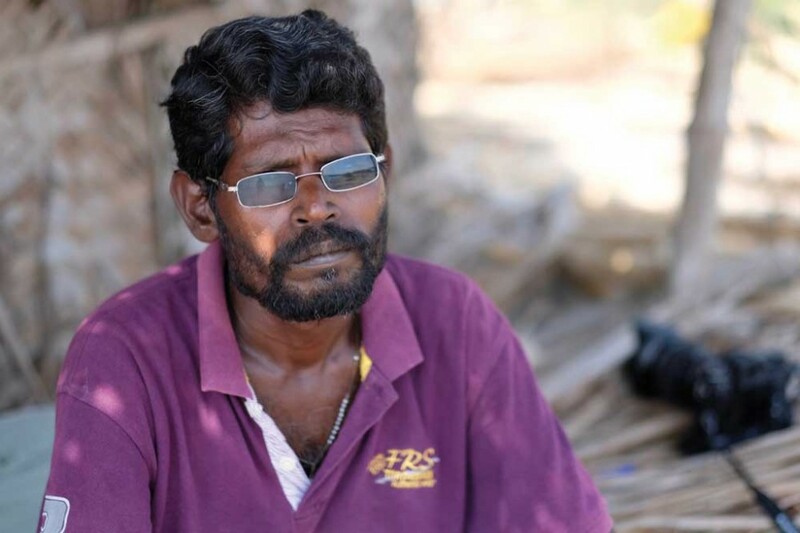 William Nelson Babu was 30 when PepsiCo came to his village Ariyankkundu. He was one of the first people in the village to cultivate Kappaphycus. He remembers when he first heard about it. “There was a dealer for PepsiCo in the area. We used to call him Pepsi Hussain,” he says. Hussain was telling people in the village about Kappaphycus, and Babu in turn heard it from his friends. They were talking about how one could earn good money by cultivating Kappaphycus. At the time, fishing was his sole source of income. Paddling on small thermocol boards, he would fish not too far from the shore. Some days he caught nothing. On the rare occasion, he would earn ₹500. Babu says that PepsiCo hired 13 people and paid them ₹1,800 per month for a year to grow the seaweed. Cultivation was done using the monoline method—a single line kept afloat by thermocol and plastic bottles. The trials were a success. PepsiCo managed to export a container of 21 tonnes of seaweed in 2001. Over the next two years, CSMCRI made improvements in cultivation. They settled on the floating bamboo raft method that is widely adopted today. PepsiCo began moving away from employing people like Babu. Instead, they moved to a contract farming model. More and more families began to adopt Kappaphycus farming. One reason the project took off in Tamil Nadu was that fisherwomen in this region were already dealing with seaweeds. Murugan Arumugam, associate professor at Vivekananda College of Arts and Science at Kanyakumari, is a marine biologist who has worked in the Gulf of Mannar since 2000. He says people in this region, who don’t have big boats for instance, have been traditionally collecting seaweeds—Katta korai, Kanji paasi, and Marikulandhu paasi. “They have been using it in their food, and also sell it to industries that use it as raw material in chemicals, medicines and fertilisers,” he adds. They were more receptive to seaweed cultivation than other fishing communities. Moreover, with the establishment of the Gulf of Mannar Marine National Park—a protected area—new restrictions were put in place for collection of indigenous seaweeds. Fisherwomen could not go every day. When they did, there were restrictions on when and how often they could go to stop indiscriminate harvesting, and change the way they harvest, to protect the corals. “This gave even more impetus to Kappaphycus cultivation,” Babu says. Again, Babu was the first to take up contract farming. He would do both fishing and seaweed work together. He would lay his nets at 4 p.m., remove them 12 hours later at dawn the next day, and sell the day’s catch by 7 a.m. Then, he would set out to work on rafts in the open sea—removing weeds, repairing nets tied to the bottom, mending the ropes, rearranging the rafts to prevent them from piling on top of each other. His family would bring his lunch to the shore so that he could manage both jobs simultaneously. In the beginning, the returns were small. “At ₹2 per kg of dried seaweed, fishing was more profitable,” he says. Then the price began to climb slowly. When it hit ₹7 per kg, Kappaphycus overtook fishing as his main income source. “By then, fishing became my supplementary income,” he adds. It also changed Babu and his family’s life. For the first time, he could give his family three meals a day. With the money from Kappaphycus, he sent his only daughter to school. “Her education since childhood has come from Kappa paasi,” he says. Today, she is in Class 12. As seaweed cultivation took off in Ariyankkundu, conflicts often erupted between those going fishing and those cultivating. “Fishing boats couldn’t come to the shore because of rafts put on the shore,” he says. A fisherman who did not get into seaweed cultivation raised objections with the panchayat. Eventually, PepsiCo representatives held a meeting in the presence of the village head. Babu says company officials told the village how it was good for them. Anyone could get into Kappaphycus cultivation and benefit from it. By 2004, over 3,500 rafts had been deployed for farming, and over 126 tonnes of dry Kappaphycus had been harvested, according to a 2017 paper by Vaibahv Mantri of CSMCRI and Abhiram Sheth of AquAgri. Women’s self-help groups began to form to take up farming. In 2005, PepsiCo expanded farming to adjacent Tuticorin district. The government of Tamil Nadu, realising the benefits accruing to fishermen, also encouraged SHGs to take up the project. The District Rural Development Agency began to support SHGs with subsidies. State Bank of India and PepsiCo had an agreement where the former would provide loans to SHGs for building rafts, and the latter would guarantee buyback from these farmers. They were very clear that this was a livelihood activity. The concept had been proven, the validation was complete. It was not a commercial business for them, and so they wanted to withdraw from it. Production steadily climbed from 21 tonnes (dry weight) worth ₹11 lakh in 2001 to 1,490 tonnes worth ₹3.72 crore in 2013. After the outbreak of ice-ice disease production crashed to 40 tonnes in 2014, before recovering slightly to 176 tonnes in 2015, and 181 tonnes in 2016. The price has increased from ₹2 per kg to ₹40 per kg between 2001 and now. Initially, most of the yield was exported, this trend has now reversed after development of two value-added products from the fresh biomass—a liquid fertiliser and ethanol. Export increased from 20 tonnes in 2001 to 700 tonnes dry in 2013. Kappaphycus cultivation continued to thrive. Farmers were getting good prices. CSMCRI, encouraged by the success, began to explore offshore farming. But in 2008, PepsiCo had a change of heart. “They decided that they were no more interested in seaweed farming,” says Mantri. Sheth, who was retiring from Pepsico at the same time asked what they planned to do with the project. “They were very clear that this was a livelihood activity. The concept had been proven, the validation was complete. It was not a commercial business for them, and so they wanted to withdraw from it,” he says. As PepsiCo exited from the business, a new controversy broke out. In May 2008, a paper was published in Current Science, India’s premier science journal, which looked at Kappaphycus farming in south Tamil Nadu. The lead author was S. Chandrasekaran, who at the time was a professor at Thiagarajar College in Madurai. The paper was titled: “Bioinvasion of Kappaphycus alvarezii on corals in the Gulf of Mannar, India”. Chandrasekaran and his team visited Krusadai, an island in the Gulf of Mannar Biosphere Reserve, and found Kappaphycus on two sites away from the shore. Specifically, the seaweed had established itself on corals—both live and dead—on Krusadai Island. The seaweed appeared as a green mat over the coral reefs covering them from the top and sides. “No part of the coral reefs was visible in most of invaded sites, where it doomed the entire colonies and occupied almost all ridges and valleys of the ‘coral landscape’,” the paper noted. Chandrasekaran’s team found that the seaweed had destroyed these coral reefs by shadowing and smothering them. As a result, the invaded corals lost their integrity, and began to easily detach from the coral matrix. The paper created a furore. The coral reefs in the Gulf of Mannar are some of the most diverse in India. The seaweed was targeting, in particular, corals in the Acropora genus—the most diverse of all the corals in this region. In 2008, corals were still recovering from the great bleaching event of 1998, which left only 25 per cent of live coral cover in the entire reserve. Coral reefs are one of the largest and most diverse ecosystems on earth. They support over 25 per cent of marine species while occupying less than 0.2 per cent of the total area under oceans. They are to marine ecosystems what rainforests are to terrestrial ones. A colony of tiny invertebrates, coral reefs are ancient creatures. Their primitive ancestors formed in the seas about 500 million years ago, much before life emerged on land. And they are still building it. They provide habitat, feeding and breeding ground for marine organisms and also protect the shore from tsunami and coastal erosion. People living along the 7,500 km of Indian coastline of depend on coral reefs for their livelihood as reefs provide more than a quarter of the total fish caught in India. With corals at further risk, a lot is at stake in the Gulf of Mannar. The paper speculated that fragments of Kappaphycus could have escaped from the cultivation site due to physical forces—wave action, underwater currents, or rough weather conditions. The paper called for immediate control measures, without which the seaweed could spread to other islands, especially in and around Mandapam. The Gulf of Mannar, the first marine biosphere reserve in all of South and Southeast Asia, is one of India’s richest ecologies. It is a large shallow bay, between the southeastern tip of India and the west coast of Sri Lanka in the Indian Ocean. Adam’s Bridge or Ramsetu, a chain of low islands and reefs, separates the Gulf of Mannar from Palk Bay, which lies to its north, between India and Sri Lanka. In 1986, 21 uninhabited islets and adjacent coral reefs were declared the Gulf of Mannar Marine National Park. The park and its 10 km buffer zone, a total of 10,500 sq km, were designated as the Gulf of Mannar Biosphere Reserve in 1989. Coral reefs, beaches, forests of the nearshore environment, alga, sea grasses, estuaries, salt marshes and mangroves make it a rich marine habitat. UNESCO calls it “one of the world’s richest regions from a marine biodiversity perspective” and covers it under its Man and Biosphere (MAB) Programme. It supports over 3,600 species of flora and fauna, including the endangered dugongs. About 128 species of corals, 147 species of seaweed, 11 species of seagrass and 17 species of mangroves, of which six aren’t found anywhere else in India, have been reported from Gulf of Mannar. They are also used by at least 168 migratory bird species. Over 450 fish species (20 per cent of the 2,200 species in Indian waters) are found in the Gulf of Mannar, making it the single richest coastal area in the Indian subcontinent in terms of species diversity. More than 100,000 people live in the 44 villages along the Reserve’s coastal area. The livelihood of people in villages up to 10 km away from the coastline is at least partly dependent upon coastal and marine resources. Over 35,000 of the 100,000 people living in the Reserve’s buffer zone make their living from fishing, seaweed collection or other marine-based activity. Krusadai Island exemplifies the biological significance of the Gulf of Mannar. Three species of seagrass around this island are not found anywhere else in India. Representatives of every animal phylum (except amphibians) are found on this island. The island is also home to an endemic organism, balanoglosus, a taxonomically unique living fossil that links vertebrates and invertebrates. The IUCN Commission on National Parks and Protected Areas identified the Reserve as an area of “particular concern” given its diversity and special, multiple-use management status. Destruction of marine habitats is the most serious threat to disruption of ecological balance in the Gulf of Mannar. Destruction of coral reefs, seagrass beds and mangroves, illegal coral mining, overfishing, over-harvesting of wild seaweed, dumping of plastic and effluents are the biggest issues. The coral reefs in the Gulf of Mannar have suffered a significant setback in the last decade from tsunami and bleaching, which has led most of the reefs to become algae dominating from coral dominating. To many, the Chandrasekaran paper was not surprising. Warnings over the possibility of a bio-invasion—a process by which an alien species can cause harm to an existing environment—had been raised as early as 2003. While PepsiCo and CSMCRI were expanding their programme of seaweed farming, alarm bells were being raised by scientists in Hawaii, where Kappaphycus had been similarly imported. In April 2004, Prof Celia M Smith, a professor of Botany at the University of Hawaii, testified before a sub-committee of the US House of Representatives that oversaw marine conservation. She narrated how a research project in the mid-1970s naively imported Kappaphycus from the Philippines and Caribbean, and cultivated them adjacent to coral reefs in the Hawaii Institute of Marine Biology. Over the years, these algae were found, initially, a little away from the site, and later, further and further away. In her remarks, Smith reported that it was wave motion that eventually allowed for the escape of these algae to other parts of the bay. Studies by the institute showed that the Kappaphycus overgrew the corals completely and led to coral mortality. “Patch reefs in Kane’ohe Bay that were 100 per cent coral cover have changed in as little as three years to 100 per cent algal cover (and coral mortality).” The algae had spread as far as 6 km from the initial site, at a rate of 250 metres per year. In a paper in Biological Invasions (2005), Eric J. Conklin and Jennifer E. Smith looked at how to remove the seaweed. The most promising was manual removal, in which one snorkeler would, using forceps, remove the algae from the attachment points, while a second snorkeler would capture the fragments using a hand net. This is a painstakingly slow process since snorkelers have to ensure they only remove the algae and not the corals themselves. The paper estimated that removal required an average of 120 person-minutes for every square metre of invasion. Moreover, within two months, the algae grew back from minute amounts of tissue remaining at the attachment points. In India, where concerns of bio-invasion had already been raised, the Hawaii case made these claims even louder. Neelam Pereira and X. N. Verlecar from the National Institute of Oceanography, Goa wrote a short piece in Current Science in October 2005 titled “Is Gulf of Mannar heading for marine bio-invasion?”They noted that some scientist-divers who had visited the Gulf of Mannar area, found Kappaphycus occupying a large sub-tidal area indicating that this species has started spreading in this region. “..(I)mpact assessment survey comprising a detailed investigation is required to assess the growth and abundance of K. alvarezii and its rate of encroachment over the native flora,” they concluded. Even the Tamil Nadu forest department was a little wary. In an order issued in December 2005, it prohibited cultivation in the Gulf of Mannar. It allowed cultivation only north of Palk Bay and south of Tuticorin. This would have even banned seaweed cultivation in Palk Bay, but the department never enforced this. Following the Chandrasekaran paper in 2008, a series of reports began to appear on the invasion of Kappaphycus. In October 2008, the Suganthi Devadason Marine Research Institute (SDMRI) in Tuticorin, along with Tamil Nadu Forest Department, conducted surveys of some islands in the Gulf of Mannar. They found that coral colonies had been affected at three sites on Krusadai island. On Shingle Island, the seaweed had firmly attached itself to one coral colony. Poomarichan island was also affected. In November 2008, the Wildlife Warden accompanied a team of experts comprising Kartik Shanker and Naveen Namboothri from the Indian Institute of Science (IISc), Bengaluru and J. K. Patterson, the director of SDMRI. Namboothri—a marine biologist and currently the director at the Bengaluru-based non-profit Dakshin Foundation—says the study was commissioned by the forest department to understand the ecological impacts of Kappaphycus. When they arrived at Krusadai island they saw Kappaphycus had taken over at a couple of sites. Only a few parts of the coral were visible from outside. “They had completely overgrown the corals. It was difficult to take the Kappaphycus out without breaking them (corals),” he says. In their report submitted in January 2009, they noted that the seaweed was found to thrive on live coral colonies. “This suggests that the alga is capable of overcoming the defensive mechanism of the coral polyps, thereby making it a serious threat to corals in the region,” the report notes. It makes grim reading. The paper compared Kappaphycus to Lantana, a shrub imported from Mexico that has now infested nearly 13 million hectares in India. This suggests that the alga is capable of overcoming the defensive mechanism of the coral polyps, thereby making it a serious threat to corals in the region. The Tamil Nadu government took note of these reports. In May 2009, the Chief Secretary instructed all departments to take “firm steps to prevent cultivation of alien species in the Gulf of Mannar and other areas”. GOMBRT, which is headed by the Chief Secretary, had also issued a similar instruction. But there was a change of heart within the government. With Kappaphycus cultivation turning out to be an important component of fisherman’s income, the government felt it could not implement a wholesale ban on cultivation. It issued a clarification in June 2009: Kappaphycus cultivation would be excluded only from the Gulf of Mannar, and not other areas. Ecologists and environmentalists felt the government was not doing enough. While no one cultivated in the Gulf of Mannar, many rafts were floating in the Palk Bay which was too close for comfort, separated from the gulf at Rameswaram just by the Pamban pass. The Pamban pass—on which the picturesque bridge that connects Rameswaram with mainland India was built— separates the two water bodies. To the south of the bridge lies the Gulf of Mannar, and to its north lies the Palk Bay that encompasses the waters between Rameswaram and Point Calimere. As Chandrasekaran’s paper speculated, seaweed fragments could drift from Palk Bay, carried by wind or current, and be deposited on coral reefs in the Gulf of Mannar. For instance, Krusadai island lies just 4 km from the Pamban Bridge. Following Chandrasekaran’s report, CSMCRI did their own survey and published a paper in Algae—a journal by the Korean Society of Phycology in 2010. CSMCRI surveyed 27 random locations on Krusadai island during May-August 2008, and July 2009. In the paper, they report that the actual extent of Kappaphycus was less than 0.0035 per cent of the total coral reef area. They also speculated that the invasive potential at Krusudai island is remote, as the Kappaphycus had a daily growth rate of only 0.7 per cent. Sheth, the CEO of AquAgri, says the controversy was trumped up, unsupported by facts. “They created this sort of a red herring.” When asked who would do that, he replied: “A lot of people who had received funding from the government for promoting seaweed cultivation, but with no results to show for it. And when this cultivation started, they got a little apprehensive.” That was the time that they pointed that it’s invasive and exotic, he adds. “If you look at the country’s green revolution, it is based on exotics. The prime success came from the wheat varieties which we got from Mexico, and the rice variety we got from Philippines,” he adds. By the end of 2015 Kappaphycus had invaded coral reefs on four out of 21 islands in Gulf of Mannar— Shingle, Krusadai, Poomarichan and Mulli. As the government wrangled with the question of controlling the invasion, more and more people were inducted to cultivate Kappaphycus and that made it more difficult to put a check on it. Arokya Carolina, a 50–year-old housewife from Olaikuda village, led an impoverished life, when a door-to-door campaign told her about Kappaphycus cultivation. So in March 2009 she and her neighbours packed into a bus and went to Mandapam to attend a three-day training programme to cultivate Kappaphycus. They offered her a stipend and at the end of the course, gave her a certificate. As she narrates it, Carolina digs through a few shelves to find her certificate from her neatly arranged room. From the outside, her house looks ordinary—a thatched roof hut with a goat tied close to the verandah. A few fishing nets are piled up in one corner while others protrude from the roof onto the sandy courtyard. But inside, the room is clean, with floors and pillars plastered with cement. “At the end of the training camp, we were offered seeds for free,” she says as she shows her certificate. She acquired a few rafts at ₹500 each, cultivated the seaweeds on a nearby shore, harvested them, and sold them. The price of seeds was deducted from the harvest price. She soon got a loan from a bank to get more rafts. Carolina’s ambitions were huge. With the loan, she acquired nearly 100 rafts. “Those days, I was making over ₹50,000 a month,” she says. For four years, she says, she was the highest earner in her village. As in other villages, fights broke out as people began to put out as many rafts as possible. There was only limited space close to the shore. The district police and tehsildar got involved. Finally, they settled the issue by allowing each individual seaweed farmer a fixed width of land on the shore. Carolina spent the money to secure the future of her children—three daughters and a son. She paid for a daughter and son to go to college in Karaikudi. The daughter completed a BSc degree, and a BEd, while the son completed an MSc . The second daughter was married—Carolina spent ₹2 lakh on her wedding. The third daughter went to join a convent as a nun. And in her moment of greatest need, it was the income from Kappaphycus that rescued her. As Carolina’s seaweed farming thrived, her husband Parisuthanathan continued going fishing, until, on April 24 ,2012, he had an accident riding his motorcycle. He was taken to Meenakshi Mission Hospital in Madurai, and underwent a surgery to insert a metal plate in his thigh. Carolina had to dip into her Kappaphycus savings to pay ₹2 lakh for the surgery. Parishunathan’s right leg was bandaged all the way from his upper thigh to his ankle. He was out of work for a long time, so the household ran solely on Carolina’s income. Today, her husband can walk—with a limp—and goes to fish, though he does not go into the deep sea due to the injury. Stories like Carolina’s make it harder for the government to completely ban Kappaphycus—at the risk of invasion of the biosphere. This is an issue that has troubled policymakers for years. In 2006, the International Union for Conservation of Nature and Natural Resources (IUCN) published a report on the prevalence of invasive species in aquaculture. “Many developing economies have opted for the continued use of alien species in aquaculture in response to the strong pressure to improve livelihoods, advance societies, and grow economies,” the authors write. It cites the example of Chile, where the government recognises the threats posed by invasive species, but also “recognises the significant societal benefits associated with aquaculture”. “There has been talk of banning Kappaphycus cultivation. That can’t be done,” says Arumugam. He says the livelihoods of some very poor people are at stake. “They must be provided with an alternative if Kappaphycus is banned. Everybody knows native seaweeds are safe to cultivate,” he adds. He lays the blame on research agencies. “Why haven’t they come up with one commercially viable, field tested technology yet? “Our scientists tried with indigenous seaweeds, but they did not come up with something which would have attracted the entrepreneur, the private sector, or individual fishermen. Only Kapphycus succeeded in this,” he adds. In their report, the IISc disputes this explanation. They point out that the Andamans is more than 1,000 km from the Indian mainland, “with a high degree of floral and faunal affinity to the Southeast Asian region.” They were making the case that though the Andamans may share a political boundary with India, the seaweed would still be considered exotic on the basis of biogeography. “Thus the occurrence of a few strands in the Andamans does not indicate that the species is not exotic to the Gulf of Mannar and Palk Bay,” the report concludes. CSMCRI also cites that it is highly unlikely that the seaweed would propagate through sexual reproduction. The IISc report says that this point is moot—a species is dangerous because of rapid growth and not because it can reproduce through sexual means. In 2014, in the Journal of Applied Phycology, a team from CSMCRI published a paper to look at how well seaweed can grow once it has drifted off. The team classified various kinds of drift based on how fresh it was, and performed experiments in the lab on their growth rate, capability to absorb nutrients, and potential for survival. Summarising the paper, Mantri notes that there is a remote possibility that the drift would survive and create a problem. It was not just CSMCRI that was pushing for farming Kappaphycus. Take for instance the National Academy of Agricultural Sciences (NAAS), a government think tank on agriculture that published a policy paper on seaweed cultivation in December 2003. The recommendations are an illustration of how research institutions bypassed an independent environmental impact assessment before undertaking Kappaphycus cultivation. It said that Kappaphycus which was introduced to Indian coastal waters more than 10 years ago, has since been “domesticated” and is considered “ecologically safe” for mass cultivation. Another organisation that weighed in on the side of CSMCRI was the Central Marine Fisheries Research Institute (CMFRI). It was one of the early champions of Kappaphycus. In 2009, it published a course manual on Kappaphycus farming without mentioning anything on its invasion potential. But it was in a report in 2010, which looked at how Kappaphycus helped livelihoods in the region, that CMFRI dismissed the threat of bioinvasion. In a footnote, Dr G Gopakumar, in-charge of CMFRI’s Mandapam Research station, is cited: “...claims made on the negative impact of Kappaphycus culture on the GoM corals are easily proven unfounded, simply because seaweeds do not have the ability to grow on live corals”. The report also mentions that CMFRI scientists “have clearly stated that seaweed farming is relatively benign to the environment when compared to the bottom-trawling activities currently taking place in the region”. On the invasion issue, CMFRI advised the state government to take decisive actions in favour of Kappaphycus cultivation, declaring it an economic alternative with the potential to raise the socio-economic status of coastal inhabitants. The National Biodiversity Board, whose statutory mandate is sustainable use of biological resources, has been a financial beneficiary of Kappaphycus farming. It had an access and benefit sharing (ABS) agreement with PepsiCo for export of Kappaphycus. By 2013, PepsiCo had paid the NBA a royalty of ₹39 lakh for export of 2,000 tonnes of Kappaphycus to Malaysia, the Philippines and Indonesia. The payment by PepsiCo amounted to 90 per cent of the NBA’s total monetary benefits (₹43 lakh) under the ABS scheme. Rakamma walks in as the evening light fades in the communal courtyard she shares with her neighbours. As she dumps a big bundle on the ground, the courtyard fills with a pungent smell. “Marikulandhu,” she says pointing at the weeds peeping out from the bundle, still dripping. Marikulandhu, the Tamil name for Gelidiella acerosa, is the main species of seaweed collected in her village Sinnapalam. It is hard work for her 55-year-old body. For the three-four bundles she brought home, she spent three days at a stretch diving in the sea. She hired a vathai (small shore boat propelled with a pole) with other fisherwomen from her village and travelled to Mulli and Valai islands, inside the Gulf of Mannar Marine National Park. She scanned the sea bed for weeds, and had to skin dive for long minutes at spots that seemed promising. 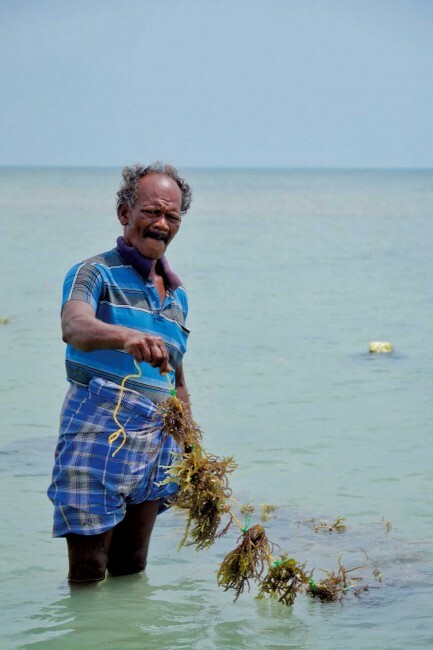 Rakamma is one of those women whose livelihood has been affected by the restrictions imposed on collecting indigenous seaweeds in the Gulf of Mannar. The forest department restricts her visit to 12 days a month. To reduce her dependence on native seaweeds, she went into Pepsi paasi 10 years ago. “One raft yielded 300-600 kg of Pepsi paasi; Gulf of Mannar is very fertile,” she says. She quickly repaid the bank loan that she had taken to put the rafts. “But, soon, the wildlife warden of Gulf of Mannar Marine National Park asked us to stop cultivating in Gulf of Mannar. Villagers were informed of this in a meeting,” she recollects. They moved cultivation to Palk Bay and production declined. In the gulf, wave action keeps the water cooler, she says. “If farming is allowed in the gulf our profits will double,” she adds. But, she knows why it wouldn’t be. As a skin diver, she knows the emerald green waters of the gulf too well. She has seen how Kappaphycus has changed some of the islands. She has seen Pepsi paasi in coral colonies on Krusadai island. “I’ve removed them with my own hands; I knew they were bad for corals,” she says. Three years ago, she was part of a 30-women team of native seaweed collectors that the Forest department hired to manually remove Kappaphycus from coral colonies in Krusadai. “We did it in a way that corals don’t break. But some corals are too hard and the weed can’t be removed by hand (it needs scraping),” she says. Following the Chandrasekaran paper in 2008, the state government directed officials of the Gulf of Mannar Marine National Park to remove the seaweed from the affected corals in those islands. Periodical weeding was necessary to save the corals and control their spreading to new areas. Since 2011, they have been involving SHGs of native seaweed collectors in the programme, which continues with funding support from the Ministry of Environment (MoEF&CC) as a part of conservation and management of coral reefs. 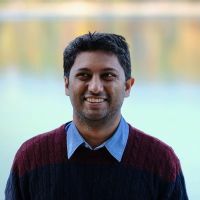 The removal in Krusadai was documented in a 2014 paper in Current Science by a group of scientists, including Chandrasekaran. While there were several options to remove the seaweed—an underwater vacuuming system called Super Sucker, or using sea urchins to clear them with grazing—the forest department chose to remove by hand plucking. “While it is almost impossible to eliminate established alien species in marine habitats, prevention would be the option to avoid incidents of invasion,” the paper concludes. Complete elimination was unlikely—only constant removal would do the trick. 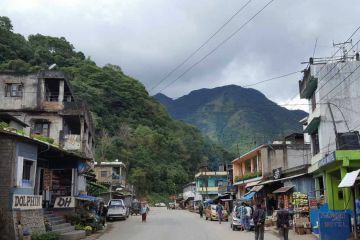 In 2010, the forest department sought more funds from the central government to control Kappaphycus. Today, after 10 years, CSMCRI claims that Kappahycus is only at two spots on Krusadai island. “It is only 0.00002 per cent or something of the coral reef,” he adds. This is contradicted in a fresh report by another government organisation—National Centre for Sustainable Coastal Management (NCSCM), Chennai, a research institute under the MoEF, Government of India. In an interim report after survey of the islands, it notes that Kappaphycus colonies were found to have established in three islands—Shingle, Krusadai and Mulli—and in the channel between Rameswaram and Krusadai islands. It, however, did not record Kappaphycus in Poomarichan island, where it was previously reported. The report also mentions that the Kappaphycus colonies establishment over the hard corals resulted in smothering of the corals. It called the spread of Kappaphycus is “a matter of ecological concern”. While scientists debated invasion, a new problem appeared on the horizon for Kappaphycus cultivators—ice-ice disease. Suddenly, the branches and segments of the seaweed turned white, making it powdery. Production dropped. In 2013, Kappaphycus production hit its peak at 1,490 tonnes. In 2014, production crashed to 40 tonnes. Both 2015 (176 tonnes) and 2016 (181 tonnes) saw some recovery, but it was far from its peak. What caused ice-ice is a mystery. A non-infectious disease, it could be triggered by conditions like temperature rise, lack of sunlight, salinity, and some bacterial pathogens. Ice-ice was first reported in 1974 in Philippines, where it wiped out entire farms. It was not just production that crashed, even the yield of carrageenan decreased by up to 40 per cent. The viscosity and strength of the gel also suffered, making it less suitable for industrial use. For the time being, this has also reined in the invasion of corals in the Gulf of Mannar. A SDMRI report suggests that ice-ice disease might has acted as an unintended biocontrol measure. While invasion and removal continue, CSMCRI has launched cultivation projects in Gujarat and Andhra Pradesh, where AquAgri has given buyback guarantees. AquAgri is now looking to expand cultivation into the Gulf of Mannar—at least in the buffer areas away from the coral. “Why shouldn’t we go there?” asks Sheth. “Outside the core zone there are huge areas of the sea—like where fishing boats are parked, where there is no challenge in doing this. We have just proposed to the government,” he adds. The government has been bullish on seaweed farming. Prime Minister Narendra Modi, while speaking to fishermen near Mangalore on October 2017, urged them to explore seaweed farming whose crops will be ready in 45 days for better income. For those dependent on Kappaphycus, the past few years have been painful. Babu has been devastated by the price fall—it has affected his capacity to feed his family, continue his daughter’s education and meet health expenses. But a new wave of companies are mushrooming, interested in Kappaphycus. He is confident that competition will drive the prices further. If only he can grow the weed without disease. Rakamma plans to put 100 rafts once the season arrives in January. All the 30 families in her village want to put 100 rafts each. This might cause scarcity of seeds, she fears. For Carolina, it’s back to square one. 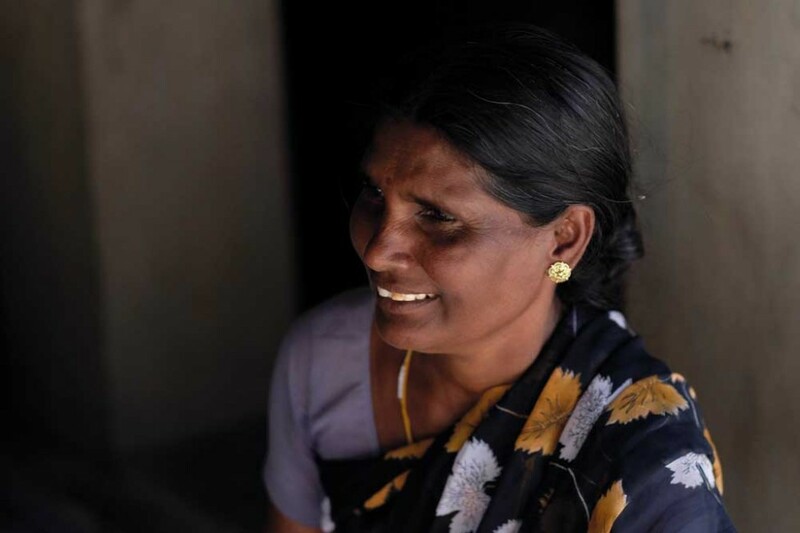 With no income from Kappaphycus, her family is now living off her husband’s income. It’s made worse by the fact that his injury prevents him from fishing beyond the shore. The previous day, he earned ₹200 from fishing. Carolina is now trying to get back to Kappaphycus. She got a few seeds three months ago, but of her 100 rafts, only five are still in a usable state. She plans to put out five rafts next month. If they do well, considering the financial situation she is in, she will get another 20 rafts. “That will do for now,” she says. Inside the state’s familiar circle of economic blockades, violence, and extortion. A series of people’s protests movement in Gujarat seeks to answer the fundamental question of the Gujarat model: development for whom?